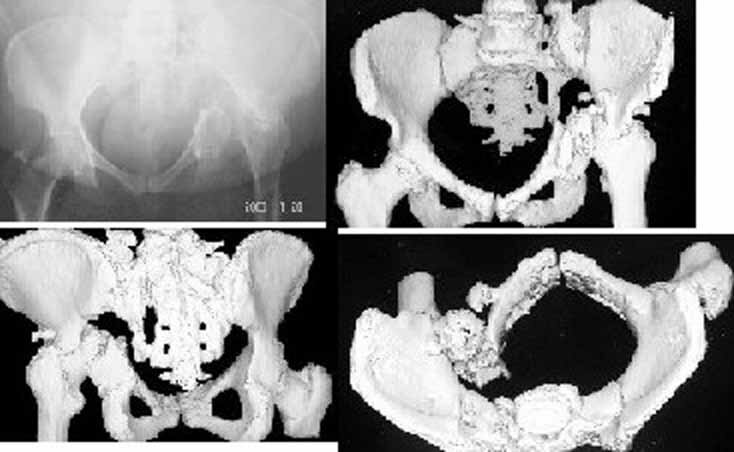 A 50 - years- old female patient had pelvic injury 18m ago due to MVA. Was refered to me for further help, she had skeletal traction for 6 weeks. Her weight 88kg , height 150cm, clinically walking with dependant on the frame with marked limping and 4cm shortening. hip flexion 80 degree, abduction 20 degree, painful movement of the hip. Reviewing her serial x-rays, she had central dislocation causing transverse acetabular fracture with vertical shear involving the sacrum. No neurological deficit. She had no medical diseases. Could we help this patient to improve her life? This patient is going to require extensive reconstruction of her hip. The acetabulum will need to be reconstructed. The skeletal traction was clearly inadequate. I wouldn't be surprised if the femoral head was compromised. There is a section on pelvic trauma. There are some very complex cases that were discussed. One case is a malunion at 8 weeks and is similar to your case. I would also contact Bill Burman and see if he can post your case on the ortho trauma web site. I'm afraid that your patient will need a hip replacement. DFAHJ> the hip. reviwing her serial x-rays, she had central dislocation with vertical shear involving the sacrum. No neurological deficit. She had no medical diseases. In our settings operative treatment in 2 stage would be offered: after mobilization of posterior aspect by perQ osteotomy under image intensifier, triradiate exposure of the acetabulum performed, the "book" closed by external fixator or pelvic clamps in supraacetabular areas, with fixaton by reconstructive plates and iliosacral screws. After 3-6 months she would be ready for THA, probably with standard technique. Pre-THA CT would be he useful.